My last post was for those who don’t like cake. This one is for those who do! 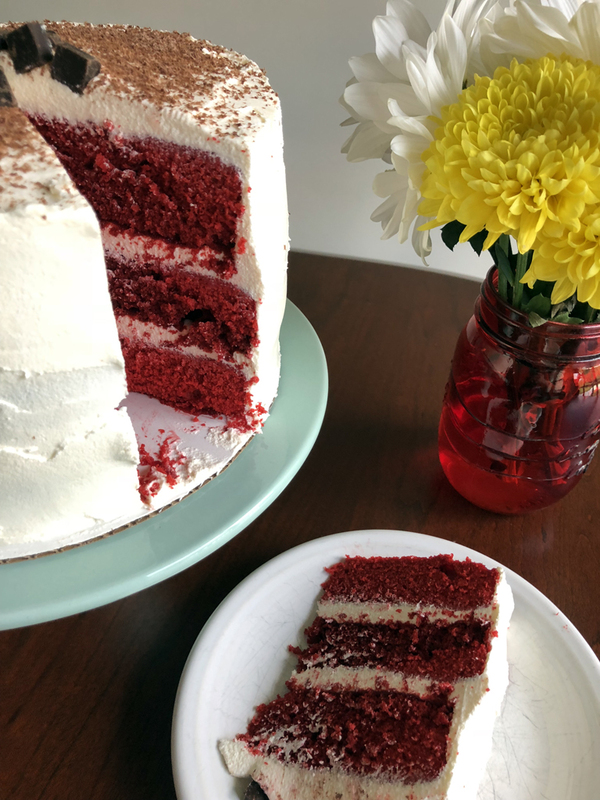 I made this red velvet cake with white chocolate cream cheese frosting, because why not! I’ve been jonesing for a red velvet cake anyway. My absence on here was unexpectedly long since I’ve been enjoying the outdoors and entertaining Alex with summer activities while Mike has been busy with work and his bands. Yes, he’s in another band playing bass, so more practices and shows are on the schedule. Plus I’ve been glued to the TV every evening watching Le Tour de France last month, a sport I got hooked on 11 years ago. Life stops (and so does the housework….well, maybe not quite!) when July comes around just so I can sack out on the couch, eat popcorn or cereal and watch dudes climb the French Alps and sprint their butts off. 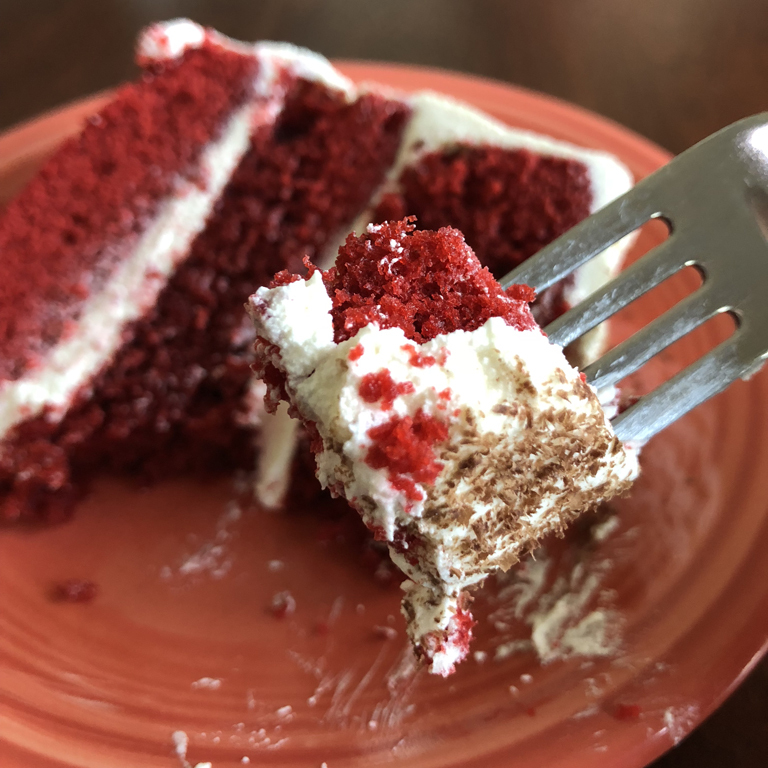 Years ago when I made my first red velvet cake for a wedding anniversary dinner it turned out…okay-ish. It was back when I was still dealing with my mother’s cake curse where it would collapse while decorating it, or it would crack right down the middle after it cooled. 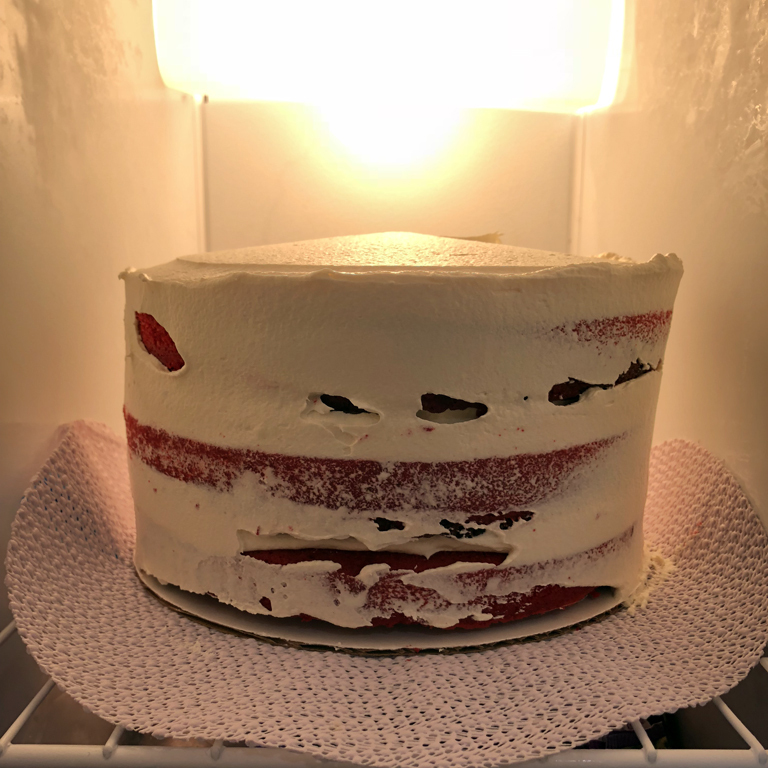 It’s also my first 3-layered cake, and I was afraid that it was too tall for me to handle. Nowadays I’ve learned a good bit on how to make a successful cake, from tiered cakes to frosting methods. One of the secrets to a successful cake is refrigeration!! Once you frost and pile on the layers, you do what’s called a crumb-coat. You spread a little bit of frosting around the sides of your cake, then freeze for about a half hour before you finish with the final coat. It’s like a naked cake. If you want to stop right here, go for it. If not, after a half hour bring your cake back out and spread and smooth on the rest of the frosting. A rotating cake stand is a must and a blessing! I’m not sure how I lived without one for years! I got this and this one too last Christmas. One or both of them are wonderful to have in the kitchen! 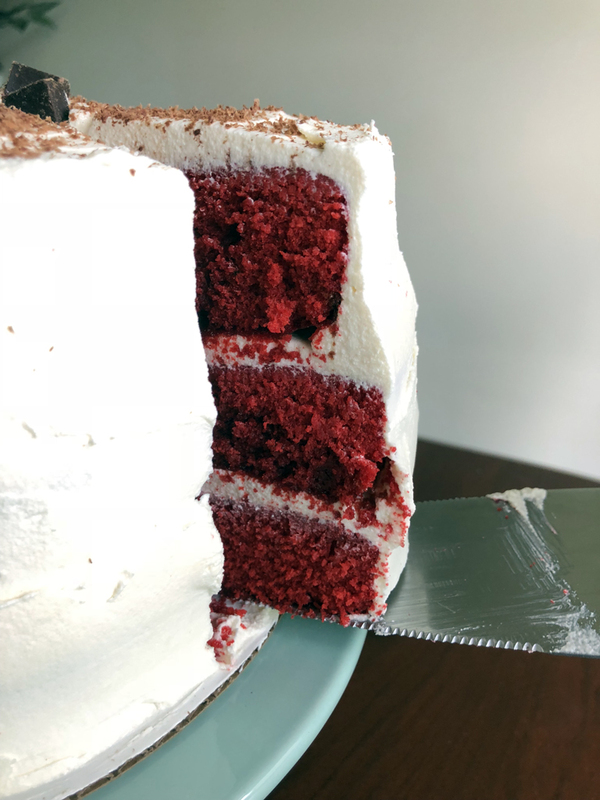 The one thing I do need to work on is to not use so much frosting in between the layers because I’ll end up not having enough for the outside. Well, I came reeeeeal close and thankfully I had just enough to cover the cake, but not enough to smooth it out. I gotta say, overall I’m pretty proud about how this cake turned out. I think Mom would be proud, too. Alex is asking for more cakes, so check back often to see some more in the near future! I was even asked to make a cheesecake, so yes, I will definitely make that happen! And maybe, just maybe, with this little perk of confidence, I may think about making cakes for other people again. We shall see! Preheat oven to 325 degrees. Spray 3 8-inch round cake pans with non-stick cooking spray. In a large mixing bowl, cream together 1 cup of margarine and sugar. Add eggs one at a time, beating well after each addition. Mix in food coloring and cocoa powder. In a small bowl, mix baking soda with vinegar and gently stir into mixture. Don’t overmix. Divide batter into the prepared cake pans and bake for 25 minutes until toothpick inserted in each cake comes out clean. Allow the cool in pans for about 10-15 minutes before inverting onto wire racks to cool completely. 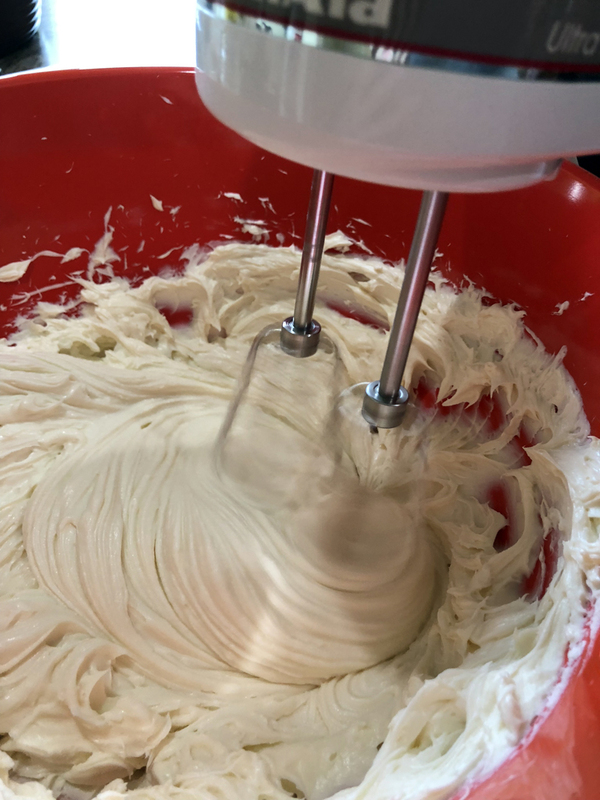 To make the frosting: Melt the white chocolate in a microwaveable dish, heating in 30-40 second intervals, being careful not to brown the chocolate. Allow to cool to lukewarm. In a large bowl, beat the cream cheese until light and fluffy. Gradually beat in melted white chocolate and softened margarine. Beat until it’s the consistency of whipped cream. To assemble cake: Using a rotating cake stand, frost top of 1st layer, then stack on 2nd Frost top of 2nd layer, then stack on 3rd layer. Frost 3rd layer, then smooth out top and sides of cake to create the crumb coat. Carefully place cake in the freezer for 30 minutes. Remove the cake and return to your rotating cake stand. Use rest of the frosting to coat sides of cake until smooth. 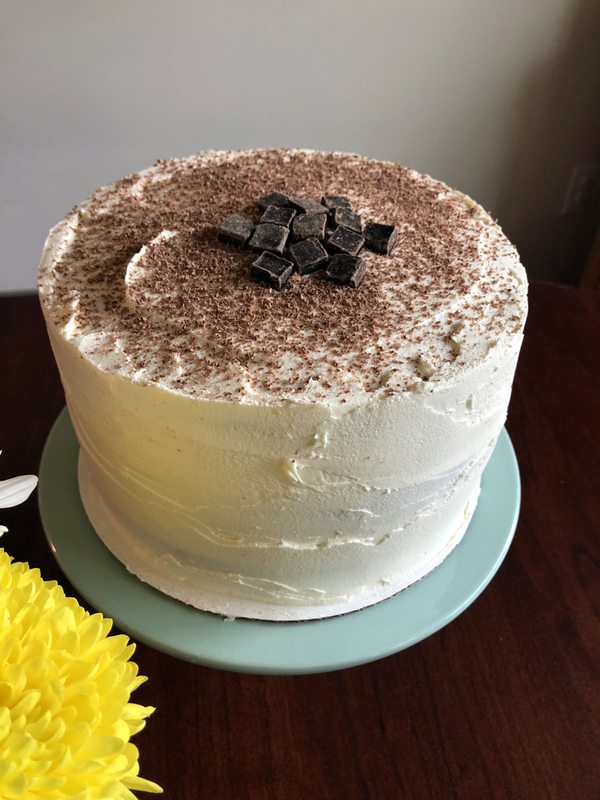 Decorate cake by shaving pieces of dark chocolate on top of the cake and place several pieces of dark chocolate in the center. Enjoy!